The dug-up Facebook posts are the first major controversy that Calloway has had to face as an aldermanic candidate. Local activists gathered in City Hall on Friday to criticize the 2015 posts. Calloway, a prominent activist who pushed for the release of the Laquan McDonald shooting video, has seen substantial support in his first run for elected office. In the February city elections, he came in second behind incumbent Leslie Hairston. The two will face off in in the April 2 runoff elections, Hairston’s first runoff since she was first elected in 1999. Gabriel Piemonte, the Fifth Ward aldermanic candidate who came in third in the February city elections, has endorsed Calloway and consistently expressed strong support for Calloway on Twitter. Willie Wilson, the mayoral candidate who came in fourth in the city elections, has also endorsed Calloway, as has the Chicago Tribune editorial board. 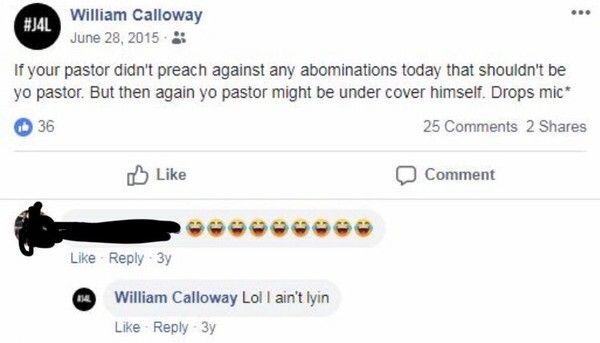 Calloway, a devout Christian, is the founder of Christianaire, a faith-based nonprofit that bills itself as working in violence prevention, social justice advocacy, and civic education, according to his campaign website. 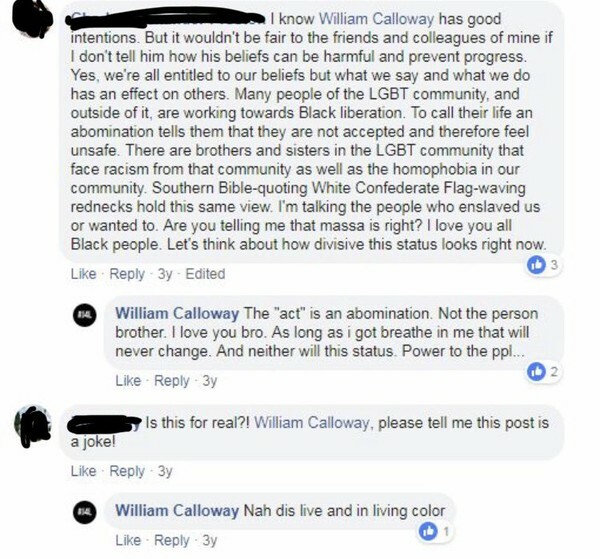 When confronted in comments about his post, Calloway defended his position. Calloway’s statement in full is at the bottom of the article. On Friday, activists from Southside Democracy for America (SDFA) and a member of United Food and Commercial Workers (UFCW) Local 881 gathered at City Hall along with Fifth Ward residents to denounce Calloway’s comments. The groups also endorsed Hairston and called on other organizations to rescind their endorsements for Calloway until the candidate apologized. The activists expressed concerns about how Calloway would handle issues like high murder rates of Black trans women and high rates of HIV/AIDS on the South and West Sides. 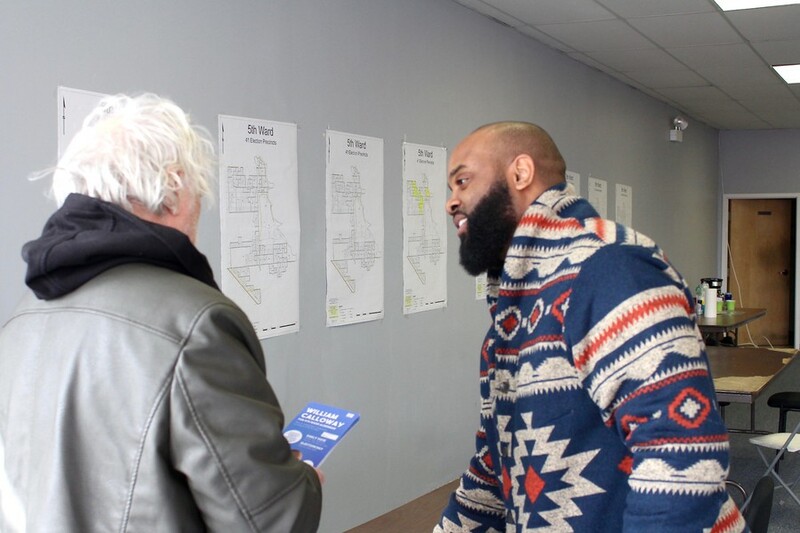 “We need somebody in office who is going to be sure that the Fifth Ward is going to get the resources it needs so that they can be part of the ‘Get to Zero’ Campaign statewide,” said Adrienne Irmer, a Fifth Ward resident who ran for 25th District State Representative last year. “Get to Zero” is a statewide initiative to end the HIV epidemic in Illinois by 2030. How voters respond to candidates’ support for the LGBTQ community has also been widely talked about in city politics more broadly, with one of the mayoral runoff candidates, Lori Lightfoot, being the first openly gay candidate for mayor. Four years ago, I posted statuses and made comments that were offensive to members of the LGBTQIA community. I initially posted them based on my religious beliefs, with no intention of attacking those who identify as LGBTQIA. My faith is never intended to offend, but to love. However, since that time, my thinking has evolved - thanks in large part to members of that community who have encouraged me to embrace and fight for all. Before, and even more since then, I have marched side-by-side with people of diverse race, gender, and sexual orientation to fight for justice in this city. Those statements are not reflective of the man I am today, and I deeply regret them. I hope that the LGBTQIA community can understand and know that, when I am elected, I will focus on protecting the rights of all Chicago residents regardless of race, gender, sexuality, identification, or affiliation, as I have been over the last four years. My love for all people is what drives me to fight for change in our community.